UPDATED: Tue., June 26, 2018, 9:50 p.m.
A jury handed Stafone Fuentes his third strike, and he could be on his way to a fourth. 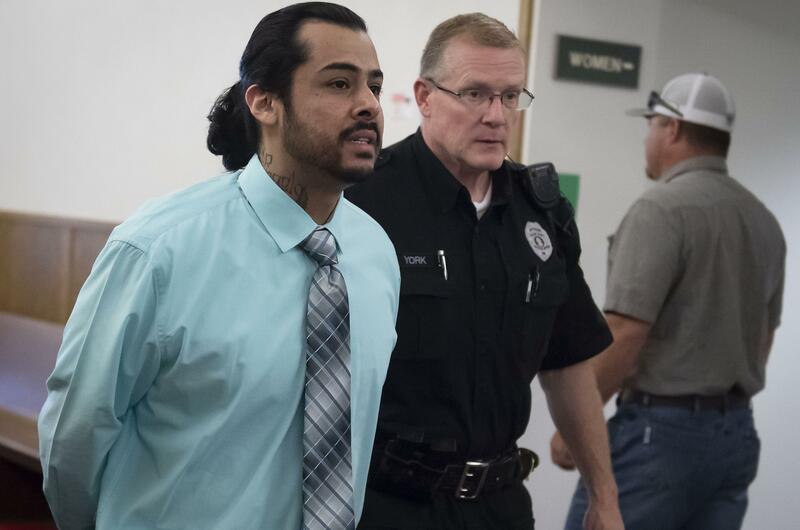 Fuentes, 33, a career criminal and admitted gang member, was convicted Tuesday of first-degree attempted murder and first-degree assault. It marked an end to an investigation and case that has taken five years – including two trials. The first, in January, ended in a hung jury. As Spokane Superior Court Judge Annette Plese read the verdict, Fuentes and his lawyer Richard Wall were hardly surprised. The attorney said since the judge refused to allow evidence before the second trial that would suggest an alternative suspect, he was handicapped in his defense. “The jury had no other choice,” he said. The conviction marks the third felony conviction for Fuentes, meaning he will have to serve a mandatory sentence of life in prison without the possibility of parole. Still, a sentencing hearing is scheduled for July 12. Fuentes also is accused of murdering a man outside the now-shuttered music venue The Hop! in September 2013. A trial date in that case hasn’t been set as attorneys awaited the outcome of this trial. The trial lasted one week, and featured testimony from the two state’s witnesses who were shot – Titus Davis and Lamont O’Neal – and Fuentes himself, who took the stand for about 15 minutes. Spokane County Deputy Prosecutor Kyle Treece argued Fuentes intentionally shot Davis and O’Neal as they sat in a parked car across from the Knitting Factory concert venue in February 2013. Davis, who was shot eight times, had to undergo multiple rounds of surgery and still wears a wrist brace to support his right arm, which was hit three times by bullets. Police wrote in court records that Fuentes’ motive might have been that he was upset that one of the victims was romantically involved with a past partner. It also could have been gang-related. Wall argued prosecutors had no evidence that placed Fuentes at the scene, other than testimony from a confidential informant who was paid to take the stand. Wall contended the other witnesses, including Fuentes’ ex-wife, were given “sweetheart deals” that gave them reduced sentences in other crimes. Wall said he plans to appeal on the grounds of not being able to present certain evidence. If granted, and if the state does not appeal further, it would allow a new trial with new evidence. Published: June 26, 2018, 5:30 p.m. Updated: June 26, 2018, 9:50 p.m.